The Kijaro Dual Lock Chair also comes with a patented dual lock technique that locks the chair in an open or closed position. The mechanism behind the design of the chair is quite stable as one can see the reinforcements made in weak areas. It also comes with mesh pockets and 2 cup holders. The Kijaro Dual Lock Chair is made on a heavy duty frame that can support a maximum weight of 287 pounds. Sturdy chair suitable for bigger people. Has an awesome array of colors to choose from. Seat height may be too high for some individuals. Some people however like a high portable camping chair. The joint bolts tend to shear with frequent use. You can however replace them with sturdier ones from hardware. Some people may find the seat too large but this can also be a plus. This folding collapsible chair from Coleman is a classic must have as it focuses on activities such as tailgating, outdoor picnics, and events of that nature. This is a four-legged picnic chair that uses high-quality fabric on its seating surface. The chair has good features that promote convenience and long term comfort. A cooler is built into one of the armrests and holds a maximum of four cans of your preferred beverage. The cooler is in an easy-to-reach vicinity for access to a drink when the one in the cup holder is empty. The Coleman Oversized Quad Chair offers adjustable armrest heights. This is to allow you to find your preferred arm height when using the chair. Coleman Oversized Quad Chair with Cooler also comes with a padded seat and back for the best levels of comfort. The storage pouch incorporated into the chair allows you to store your personal items and magazines without much worry. The chair has a heavy duty frame that supports a maximum weight of 350 pounds and a good size to serve people of different body sizes. Coleman Oversized Quad Chair is easy to setup and compact when folded. This makes it very easy to transport. People who love tailgating and watching outdoor activities are advised to make use of Coleman Oversized Quad Chair as it provides the best conditions to enjoy the outdoor festivities while keeping your favorite drink cool. The general measurements of Coleman Oversized Quad Chair are 37 inches wide, 24 inches long and 40.5 inches high. With everything this portable chair has to offer, one can’t ignore the luxurious experience this Coleman Quad Chair with cooler provides. Among the drawbacks of this portable chair is that it can’t be used in a home especially where there is wooden furniture. Wood furniture boasts of boldness and elegance while the Coleman Oversized Quad Chair creates an artificial feel in the house. The cooler is a big plus. Frame may rust if not properly maintained. A big plus that distincts this camp chair from most others is that it has a sturdy powder coated steel frame that doesn’t rust. The mesh material used for the seat is breathable hence providing a welcomed airflow. The Kelsyus Original Canopy Chair features an armrest cup holder for your cold drink. The Kelsyus Original Canopy Chair is best used in a sunny weather which allows its canopy to be useful. But who said you cannnot use it in any kind of weather or activity? The chair can support a maximum weight of 242 pounds and has dimensions of 37 inches by 24 inches by 58 inches. It is an ultralight backpacking chair. The canopy is a plus for protecting against the sun. Canopy can’t be adjusted hence useful only when the sun is in the right position. Folding it when new may be a challenge. It has a slightly low height from the ground. When the Alps Mountaineering King Kong Chair is mentioned, the first thing that comes to mind is durability. This is a portable camping chair that is supported by a four-legged frame and covered with fabric to provide a sitting platform. This backpacking chair is made of a Khaki polyester fabric that lasts long and doesn’t show effects of wear and tear. The material also provides a comfortable seating experience as it is soft. It has a strong and compact frame that allows it to hold a maximum weight of 793 pounds. The Alps Mountaineering King Kong Chair is supported on a stable, sturdy powder coated steel frame. The powder coating prevents the frame from rusting making it the best choice to use in any weather conditions. The chair comes with easily adjustable armrests and side pockets to store delicate personal belongings such as phones. This should be your outdoor chair of choice as it offers comfort and stability, is small enough to fit in a bag and is very easy to transport. The chair's dimensions are 20 inches by 38 inches by 38 inches. The Alps Mountaineering King Kong Chair is used by hikers and military troops as it is one of the most stable portable chairs around. 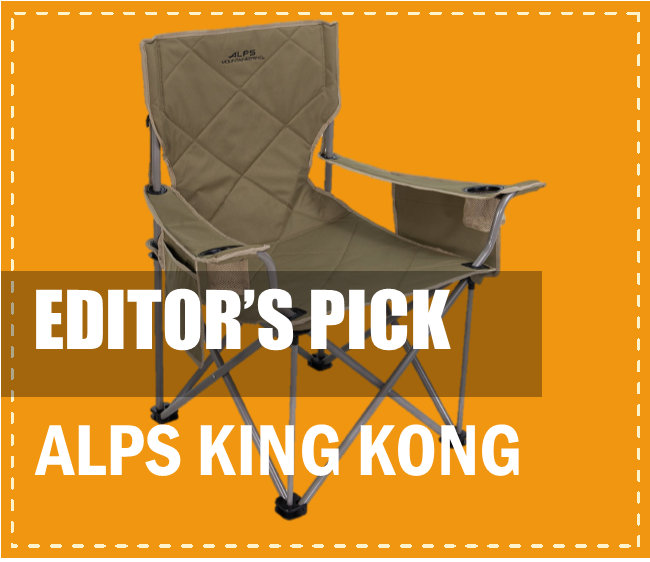 When you buy the Alps Mountaineering King Kong Chair, you get an ultralight camping chair that has a relatively high weight threshold. In cases of damage to the chair, it is advised that you get rid of the portable chair in an environment friendly way. Worn out and damaged parts can be harmful to users of the chair. Can support high weight capacity (up to 793 pounds). Great chair for larger individuals. Well padded and rugged canvas making the chair very comfortable. Has an array of places for glasses, books, drinking water among others. Very good height from the ground. The bar cutting across the front of the chair is uncomfortable to the legs. Somehow heavy it compromises easy portability. However, this is the price you pay for the quality it offers. 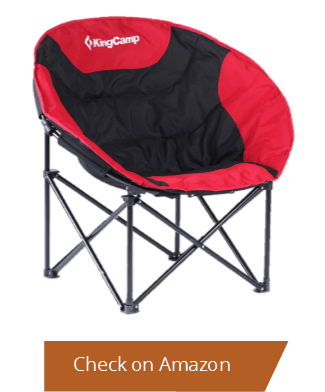 The King Camp Moon Leisure Lightweight Portable Folding Chair is an all-round padded seat that provides unrivaled comfort. 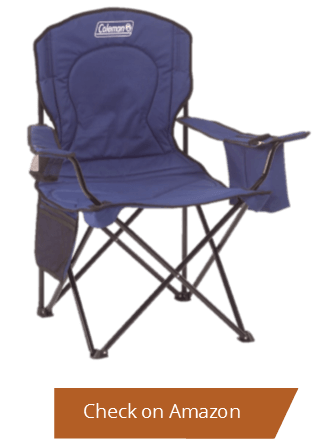 The Moon Leisure Lightweight Camping Chair is a comfy addition to any home, camper, boat, or patio. A large bag pocket on the back allows one to store personal items and other necessities required for both indoor and outdoor activities. The chair can be folded and transported with a handy shoulder strap that comes with the chair. This makes it easier to carry along nature and hiking trails. This lightweight, portable camp chair can also fit in a bag pack if you need to store it and does not take up a lot of space. One common disadvantage of owning this particular portable chair is that it requires constant maintenance such as looking and getting rid of rust on the frame and checking the screws that hold the frame together to make sure that they are completely in place as they tend to loosen over time. This foldable camp chair can accommodate people of different sizes and weights but has a maximum capacity of 260 pounds. The chair measures 35 inches by 8 inches by 8 inches when folded and 33 inches by 28 inches by 16 inches when unfolded. An overlooked benefit with the King Camp Moon Leisure Lightweight Portable Stable Folding Chair is that it is very easy to clean. This, coupled with the above mentioned features makes it one of the best portable chairs in the market. Very lightweight but compact foldable camping chair. Has got a very stylish design that will appeal to your senses. Has a low height that compromizes its comfort. Has got little to no padding which contributes to its discomfort. This little gem from Best Choice Products is among the favorites as it focuses on providing a comfortable seating experience. 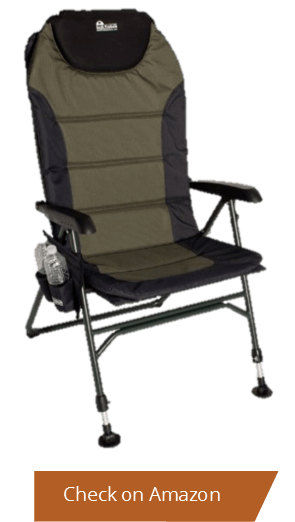 The Zero Gravity chair is a long one-piece reclining camp chair that comes with a foldable frame. One thing to note about the Best Choice Product Zero Gravity chair is that it can only be bought as a pair so go for it if you don’t mind that it comes in twos. The Zero Gravity chairs are usually used for camping. However, you can also buy them if you are looking for furniture to rest on your patio or just doze off beside the pool. Both adults and children alike can use the Best Choice Product Zero Gravity Chairs as it is fairly simple to setup and does not require you to assemble any parts. 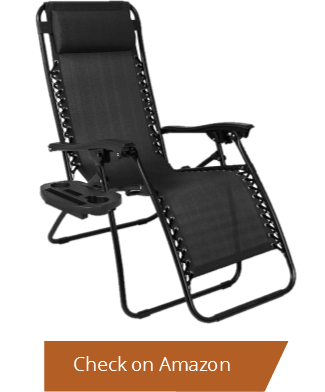 The versatility of Zero gravity chair makes it adaptable for use in non-camping activities as well, which means you wouldn't buy something that you will be using only once in a while. 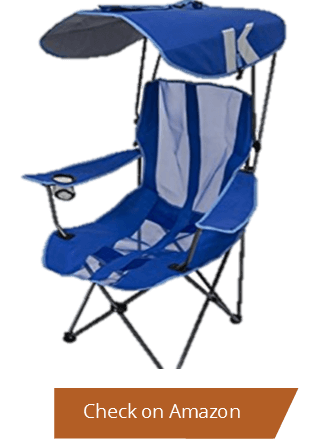 These camping chairs are easy to fold thus help you save time when you have to pack up for your trip, and they weigh less as they are made from lightweight materials, so they are easier to transport. A bonus feature for this amazing chair is that it comes equipped with a removable and adjustable padded headrest for better head and neck support. That means that you can use the chair for longer periods without getting muscle aches. The chair also comes with a cup holder tray for you to place your beverages, phones and other small items. Imagine that. You do not even have to carry a small case to make sure you won’t lose your keys or phone as you lounge in the wild or beside the pool. Best Choice Product Zero Gravity Chair has been engineered to help give a pleasurable seating experience by providing a space to keep your necessities close. For a few extra dollars, one also gets replaceable elastic cords that adjust the chair to suit your body size. The lightweight material used to build the chair is resistant to ultra violet sun rays thus helps in prevention of unwanted tanning. 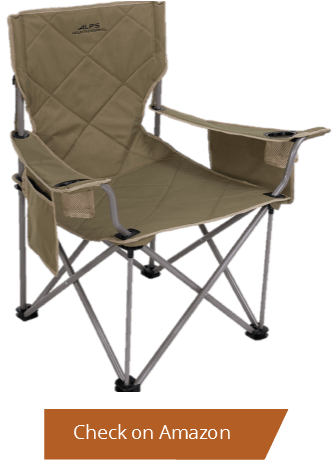 The above mentioned features make this camping chair a must have for anyone who likes the comfort in the wild. It will not hinder your movements as it doesn’t need much space and can always be folded and packed for later use. Disposing of The Zero gravity chair has proven to be a challenge as the components used to make the chair are not bio-degradable. Finding alternative uses for the damaged chair is the mode of disposing. Comes with knobs to help keep you reclined in your preferred position. Metal frame and screws may rust. Hardware gets loose easily after assembly. This is one of the few outdoor chairs that focuses on being light and fairly strong. It comes equipped with a heavy-duty aluminum frame that supports a maximum weight of 330 pounds. This chair can accommodate people who are heavy without damage as the aluminum frame is of good quality and is quite strong. The aluminum frame is also rust proof making it usable in humid weather conditions such as tropical weather. 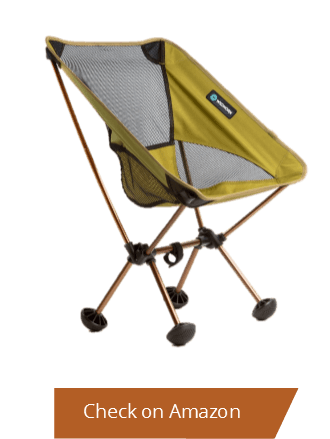 The Terralite Portable Camp Chair has a total weight of 6.6 pounds making it very light and easy to transport to various outdoor activities such as a barbecue. It is not complicated to setup if your follow the instruction manual steps. It is a comfortable chair to use as the zipped mesh and fabric used facilitates a sinking sensation as the fabric molds itself to your body's outline. The use of the mesh on the chair makes it a fairly easy chair to store as it easily fits into the pouch provided. The chair features Terrogrip feet that help it float on sand or mud making it a perfect fit for use in different environments. The above mentioned features make it ideal for the beach, tailgating, fishing or a picnic. The Terralite Portable Camp Chair is one of my top picks for the best ultralight backpacking chairs. The metallic component used to make the chair is durable. One needs to regularly check the Terralite Portable chair for signs of tear. Exposure of damaged parts may lead to serious injuries. Has paddings on the legs to prevent sinking into the ground. 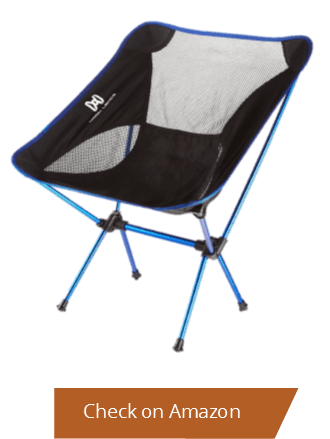 Lightweight camping chair that is easily portable. Lacks the cup-holder that disadvantages it when compared to its counterparts. This is a supportive, comfortable, conveniently stable chair. It is among the best choices for various activities such as camping, hiking, and some home uses. It has a strong aluminum alloy frame that supports a maximum weight of 240 pounds. The chair can be used by photographers who need to sit still for a long time as it provides a stable platform for them to get a clear shot. The Moon Lence Outdoor Ultralight Portable Folding Chair is available in four colors: dark blue, light blue, red and orange. It has a mesh made of Oxford 1000D cloth which makes it breathable and soft providing comfort. The Moon Lence Outdoor Ultralight Portable Folding Chair has a simple setup process making it easier for both adults and children to use. The carry bag is conveniently offered to help with transportation as it fits in most car trunks and storage of the chair. The chair is fairly small and doesn’t take up much space. The Moon Lence Portable Folding Chair with Carry Bag weighs around 2 pounds which makes it super portable. The aluminum alloy metallic frame that is used to make this backpacking chair is not biodegradable making disposal a headache. Broken and damaged parts may cause injury. Be sure to regularly check for those to avoid harm. Very lightweight and hence suitable for backpacking. Doesn't include a user manual hence you'll have to figure out everything by yourself. Even then, it is not complicated. Sturdy and offers an excellent durability. Has an excellent stability once adjusted accordingly. Very comfortable with a large area to rest your back. Heavy hence not easy to carry around. This weight however is compensated for by the sturdy build. The Coleman Rambler II Stool is one of the most preferred choices for ultralight camping chairs. It is perfectly sized for all manner of outdoor activities such as fishing, camping and so much more. It is a quick and easy seat to setup as all one needs to do is slide the frame and sit. The Coleman Rambler II Stool has a simplistic frame that slides open to become the four legs of the chair. The frame is a powder coated aluminum frame that doesn’t rust making it usable in any weather conditions. The Coleman Rambler II Stool uses a tough polyester fabric as its seat. The fabric withstands long periods of wear and tear. It is a lightweight chair but has heavy duty construction which enables it to support a maximum weight of 220 pounds. Very lightweight and minimalistic hence easily portable. Has a strong canvas material and stable metallic legs which make it sufficiently durable. It is generally a small chair with no back rest. Best Camping Chair Buying Guide: What Should You Consider? Portable camping chairs are designed with many key points in mind, one of which is to make them as comfortable as possible. There are many chairs out there, and different chairs suit different people's idea of comfort. You might be the sort of person who is comfortable with plush cushions or stable seated surfaces made from soft fabric. Some outdoor chairs offer these kinds of comfort; it makes it easier to sit on them for longer periods after all. Comfort does not only come in when you think of the seat’s padding. A comfortable chair is one you can easily fold yourself into. Furthermore, the frame design of a portable chair is a contributing factor when it comes to comfort. That’s because some frame designs make some chairs more stable than others. Durability is another key factor that will determine your choice of a picnic chair. Good portable chair brands will use high quality materials to make strong and durable chairs. Wood and artificial substances such as aluminum alloys create strong and long-lasting frames. Frames that interlock are more likely to last longer than most other frames. Alternatively, you can go for a frame with strongly reinforced screws. Strong screws make the frame compact and therefore less likely to simply fall apart with time. Additionally, choose fabrics such as Oxford 1000D and polyester for seating surfaces because of their exceptional ability to withstand long periods of wear and tear while providing a certain level of comfort. 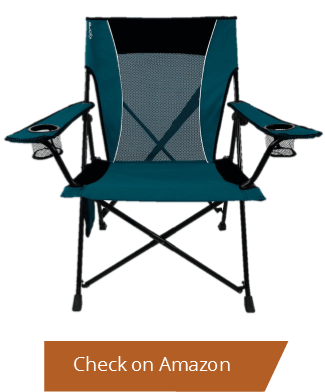 This is arguably one of the most important factors in one’s choice of portable chairs for camping. Space is a treasured commodity for many backpackers and being able to fold up chairs and store them away counts as a real blessing. Most of the backpacking chairs available have been carefully designed to ensure they stack together neatly and safely. This helps facilitate small space usage when storing them for later use. However, do not sacrifice a proper size seat for a smaller one just because you want to "save on space." Remember, most of the time you are going to be using the chair, not storing it. So go for a chair that you can comfortably seat yourself in but which folds into something small enough for you to store easily. If you have enough storage space though, just go for the most comfortable one. Ideally, the best backpacking chairs are not only well designed, durable and easy to store; they are also incredibly user-friendly and easy to set up. In fact, for some of them, you will not need to even assemble anything. All you have to do is just take it from its delivery package and unfold it. If you order your chair from the internet, make sure to check the delivery box content against what you got inside the box. Lighter and less bulky portable chairs are also easier to move around and therefore easier to use. Now, portable chairs, like most other goods in today’s market, come in two distinct groups: organic and inorganic. Before purchasing one, make sure you check whether the materials used in making the chair are eco-friendly (if you are the kind of person who believes that the levels of pollution in the environment are high and believes in choosing products that will help mitigate the situation). Ideally, the best camping chair should be lightweight and fold small. Artificial alloys are lightweight materials and since most portable chairs are made of those materials, they are generally lightweight and easy to move around with. 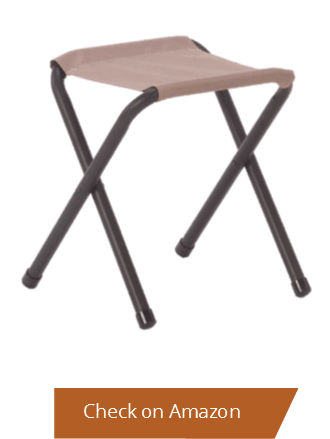 Wooden frames for the camping chairs tend to be heavier which limits the variety of chairs one can choose from. With advancement in technology however, we shall encounter lightweight frames that can hold a high capacity of weight without damage. All in all, be sure to follow the weight recommendation so as not to break the chair over excessive weight. 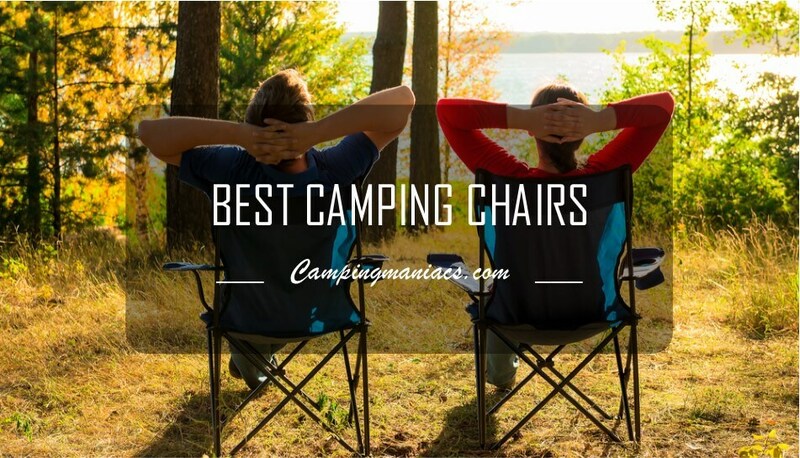 As we have seen, there is an excessive of best camping chairs and you can definitely find your choice among the many we have reviewed. When looking to buy folding camping chairs, it is advisable that you read the reviews of the different types and familiarize yourself with the buying guides to avoid disappointments. Among the indispensable factors to look for before settling for a backpacking chair, comfort and convenience supersede. Look for a camping chair that is lightweight enough to allow easy portability but also sturdy enough to withstand longer periods of use. The recommendations we have given are the top rated and have stood the test of unquestionable service.